Vinsterfossen in the Vinstra river is a regulated waterfall and nowadays does not much resemble its former splendor. The waterfall can still be quite impressive, even though much of the river’s water is transported by pipe lines to the power plant down at Slangen. The river Vinstra falls down over 20 meter, almost in a single drop. From a hill, opposite of the fall you have a good view on the Vinsterfossen, also written as Vinstrafossen. It is also possible to go to the top or the base of the fall. The surrounding of the fall is very beautiful with lots of firs. 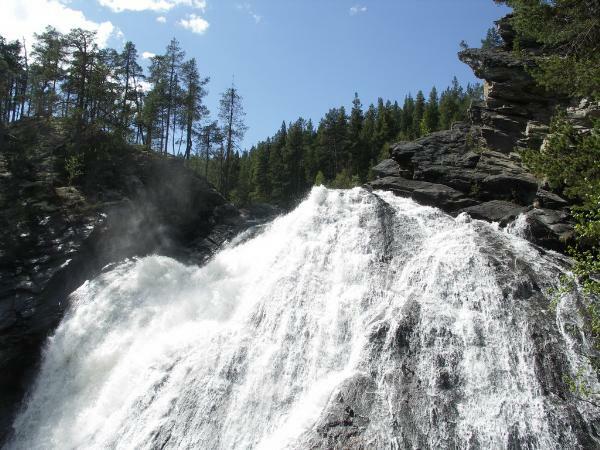 The waterfall is situated at the beginning of the Jotunheinvege, south west of Vinstra, municipality Nord-Fron in the region Oppland. To go there: in Vinstra take road 255 to the south west direction Kvikne/Skabu. In Skabu keep right and take road 425 to the power plant Slangen. From here the waterfall can be reached by walking along the river heading south. Nearby there are several other small waterfalls: Kamfoss or Espefoss.